Back in October 2018, Billy Gundry, Operations Manager at the MRS Training & Rescue’s Knottingley Station, was featured as a guest on The Biz Hour podcast. Steve Twynham, the presenter of the podcast, and Billy spoke about our then new confined space management app, SACCS. Billy has been back on the podcast again – speaking to Steve about MRS Training & Rescue’s new working at heights training courses and the new working at height facilities at our Knottingley station, which are approved by GWO. 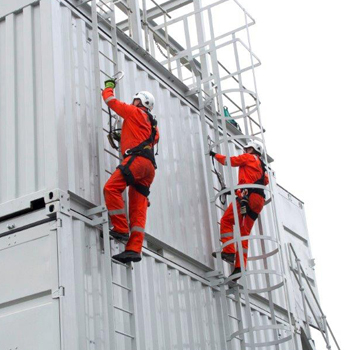 Listen to the podcase here -> The Business Hour 96 – Working at Heights Training. We’re proud to be a leading provider of Working at Heights courses and offer a wide range of courses applicable to many different industries. In addition to our staple working at heights courses, our new facility in Knottingley is approved by GWO (the Global Wind Organisation) – which means we can now cater for those working in the renewable energy industry. (b) obtaining access to or exit from such place while at work, except by a staircase in a permanent workplace, where, if the measures required by these Regulations were not taken, a person could fall a distance liable to cause personal injury. At the start of the podcast, listeners witness Billy and Steve discussing Billy’s previous time on The Biz Hour, in October 2018, where confined space training was spoken about. Listen to the previous podcast here -> Confined Spaces ‘the secret killer’ and an app to save lives. Basic working at height – covers mobile scaffolds, ladders and working in harnesses. Rooftop safety training course – for people working on roofs, sloped roofs, wet roofs, fragile roofs and so on. Management training – not necessarily for people working at height but for people who have legal roles and responsibilities for putting people to work at height. With all the training offering a lot of practical, hands-on exercises too. Billy then moves onto explaining how our team at MRS offer competency assessments within the courses to compliment the working at heights training. This is because people who work in the turbine industry, who require the GWO accreditation and certification, must also receive first aid, firefighting training and manual handling – which is basic training but is specific to working in a turbine. Steve: When this new facility is commissioned on site, how many people can you get in there at a time? Steve: Really exciting times for MRS Training and Rescue – from just how you’ve developed over the years! Steve: Do you have any target dates, when you hope to go live with this? MRS Training & Rescue provides training, working at heights rescue, industry advice and WAH equipment hire. Equipment hire may come in handy for companies who are undertaking temporary working at heights work - this could prove to be more beneficial for customers based upon their requirements. If you require general working at heights training or wind turbine rescue courses, please call the team at Knottingley on 01977 676700. Alternatively, visit our contact us page for more options.